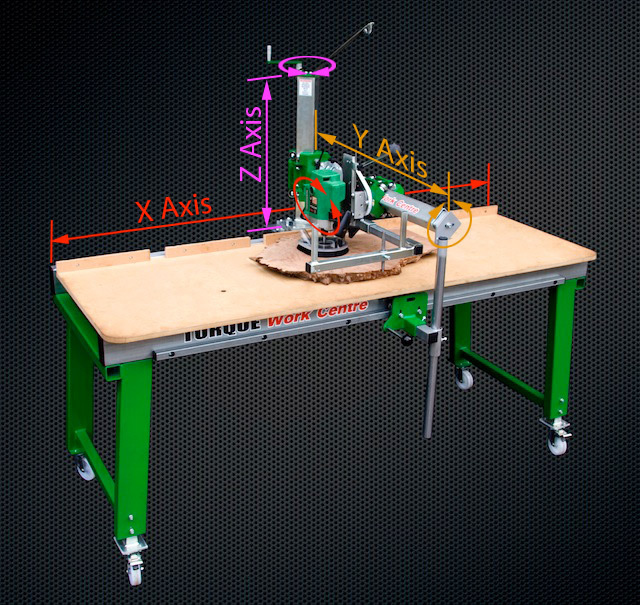 The following steps may have been done specifically on the Torque Workcentre, but they are equally relevant to many other tools as well. 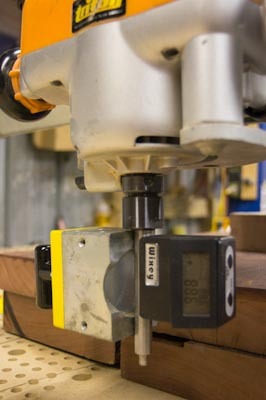 As I have often said, the digital angle gauge from Wixey (Oz supplier Professional Woodworker Supplies) is a shop apron tool. It is too useful not to have it with you at all times in the workshop. Using it to check, and to setup a tool so it is exceptionally accurate is one of the best uses for it. 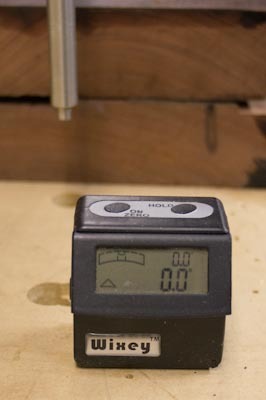 To be able to get a tool within 0.05 degrees is significantly accurate for woodworking, and from there things are always so much easier. Take the gauge, and set it on a true surface (such as the bed of the workcentre), and zero it. On this Wixey Gauge you can see there are two sets of numbers. The large set is the one the user can zero, then compare the angle of the first surface to a second, and this is what I use for setting tools up. The second is like a bubble level, only digital (and still accurate to +/-0.05 degrees), so it gives an absolute angle reading. It just so happens, by complete fluke (or perhaps not – when I poured the slab we did use a spirit level to try to get the slab flat) that the top of the workcentre is actually at 0! Next, we want to ensure the arm is not twisted around at all (around what I call the Y axis). I do this first, because once the arm is level and tightened up, I won’t want to loosen it again to be able to rotate it! To do this, I use a 1/2′ steel rod in the collet of the router. Has to be steel – most stainless steels are austenitic, and therefore not magnetic. 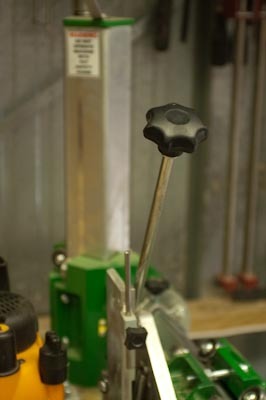 The angle gauge is then stuck onto the rod, and the whole arm rotated as necessary to achieve 90 degrees. I do it this way because in the end, what is important is the router bit is perpendicular to the workpiece. It doesn’t matter how much degree of error is in the router mount, or in the plunge mechanism (typically very little for the TWC), but if the router bit is exact, there are no other accumulated errors. Next, the Y axis arm itself is made parallel with the table. Again, zero the gauge parallel to the arm, then lift it onto the arm itself and adjust. You can get reasonably close with the adjustments provided on the front bearing set of the TWC, but I find the final way is to simply move the carriage forward and backward for minor adjustments, or to actually lift or push down on the arm to get it right. This is done with the outfeed support bar loose, then tightened to lock the arm when it is parallel. Finally, get the tool so it is rotated correctly around the X Axis. Here I have it with the tool slightly out (88.6 degrees). The MagSwitch magnet at the back was my idea because I found the magnet in the newer Wixey angle gauge was not strong enough to support its own weight (sadly). Unfortunately, this also proved to be a very bad idea as I’ll show in a second. So by loosening off the X Axis rotation, I was able to bring it to exactly 90 degrees. Again, this means the router bit is exactly perpendicular to the table (and if using a surfacing bit, it will make the top of the timber parallel with the reference plane (aka the table top)). The point is, with a digital angle gauge this sort of adjustment to this sort of accuracy is a piece of cake, so you don’t have to be concerned about using the machine as you need to, then resetting it back to being exactly perpendicular to the base in both dimensions (X and Y). Now, as to putting a big magnet near the angle gauge, it did turn out to be a very bad idea. Turns out the internals of the angle gauge are magnetic, and held in place by their own magnetic strength. So when angle gauge accidentally got close to big magnet, the internals decided to shift……. 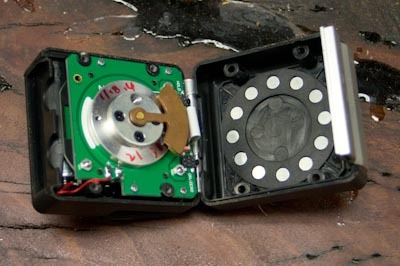 I ended up having to take the gauge apart, discover what was wrong and put it all back together. I managed it, but it will never look quite right again. Bugger. Specifically, that ring of tiny circles are each small magnets, and they got a bit too excited when the MagSwitch got close. Mea culpa. The brass- looking pendulum thing is how the new Wixey does dead-levelling – using gravity to ensure it knows the absolute way up. 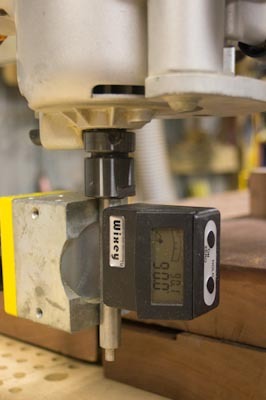 A digital angle gauge is pretty much a must-have tool. Don’t bother with one of those sold in the big hardware stores – tried a few and found they are crap. The Wixey is definitely one that does the job. I guess from recent articles that you’ve been able to determine my opinion of the Torque Workcentre! With the Christmas madness coming to an end for another year, I’m going to (please, hopefully), have some more time to get some new videos made, and the Torque will definitely be featured in some of those! In the meantime, Professional Woodworkers Supplies is now a distributor of the Torque Workcentres, which potentially opens all sorts of interesting doors with amalgamation of products from Torque, Woodpeckers, Incra and Wixey. Something that will benefit all Torque owners (and potential owners) – taking the exceptional versatility of the Torque, and merging it with the incredible accuracies achievable with the other brands. I’ve been touching on how it may be incorporated, but having fully developed solutions would be excellent. On Christmas Eve, the courier finally managed to locate and deliver the package from Torque Workcentre (TWC). Inside was a shorter main beam and a few other bits n pieces. I still have the 1300mm arm, which will prove invaluable when working with very large tops, and breaking down large sheet goods, but in a shed the size of mine, it is more suitable having a shorter arm. To my mind, the optimum length seems to be the 900mm arm that I have now fitted, but it really does come down to your intended purpose, and the amount of space you have available. This was the main purpose of the package – downsizing the main arm. And rather timely as well – with my last quick project (a couple of dovetailed boxes for Xmas presents), I found I really did need easy access to my planer, and found I had to move it to a more accessible location. With space ever-increasingly at a premium, it happened that the planer is now alongside the thicknesser, and it was overhung by the larger arm. Dropping it back to 900mm now again provides decent access through, past both machines. Changing over from one arm to the other obviously meant the carrier had to be removed, and that was an ideal time to add a minor upgrade that I actually suggested. Once again, having local manufacture is worth its weight in gold – they can be responsive, and are contactable! The suggestion I made (well, one of a list) was to do with the Y axis lock (which is the knob on the back of the Y axis carriage). By original design, when wound in to lock on the arm, the twisting motion caused the carriage to walk along the Y axis. What TWC came up with (and now a standard fitting for future machines) is to have a metal plate affixed to the casting, the knob can wind in against the plate, causing it to tighten on the Y axis. Another suggestion made was to replace the 4 point knob on the plunge arm with a similar one to the Y Axis lock – I found the 4 point knob uncomfortable when a decent amount of pressure was required. This wasn’t too difficult – the knob is restrained with Locktite which took a bit more effort to crack, but couldn’t resist the combination of a large Stillson and 24″ adjustable spanner! I still want to do something about the plunge stop, which I’m finding slips a bit too easily, especially with multiple plunges. It may be simply a matter of adopting more of the mechanism from the Triton router – larger post and increased area of the lock knob. I also want to incorporate the multi-post stop that Triton uses – allowing multiple plunge heights to all be pre-set. Another proposal that I’ve made is the incorporation of Wixey Digital technology into the TWC. A combination readout for all three axis would be ideal (and further reinforce the concept of this machine closing the gap to a full CNC machine). It wouldn’t actually take too much to turn a TWC into a CNC machine either…….. In any case, as a proof-of-concept I have been looking to fit the Wixey Planer Height Gauge to the TWC, and this looks a likely location for one. Despite the awesome capabilities of the TWC, I still find having another router mounted in the traditional below-table position invaluable. With the Woodpeckers Router Lift, I am no longer dependent on the plastic worm gear of the Triton itself. I still use it during bit changing – preferring to use the Triton’s ability for rapid height change to bring it up to full height, which has a combined benefit – it means the shaft gets locked for one-handed, through table bit changing, and still uses the in-built safety mechanism of the interlock to prevent the bit being able to be changed without the router being turned off, and not allowing power to be restored until the shaft is free to rotate. For accurate height setting though, the Woodpeckers Router Lift is second to none. I still have to finish the install – just need to mount the remote digital readout. Under the table, the Router Lift in as-used condition – it may look a bit dusty, but that’s par for the course for wood working power tools! I was going to use a spare Triton switch to start and stop the router, but the Pro Router Switch is superior. Where you can see I have mounted it makes knocking off power with your thigh easy, so even if both hands are occupied, you can still easily stop the router. The deluxe version has lights under the switches – when power is available, the on button glows. When running, this light is out, and the stop button glows instead. It acts as an extra visual indicator to let you know whether power is being supplied to the router, or not. 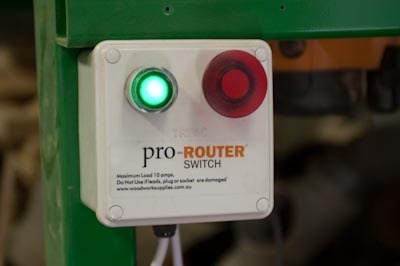 It is also a no-current release switch – if power is lost (tripped circuit breaker, black-out etc) then the switch automatically turns off so the tool doesn’t immediately restart when power is restored. The Triton switch is a lot more basic – when power is restored, the tool takes off again, with obvious safety implications. From the two small holes you can see above the switch, I originally thought that would be a good mounting point, but then suddenly remembered that the Extension Table for the TWC slides through that RHS, and the ends of the switch mounting bolts would have impacted on that when I add one to my TWC. Mounting the switch a little lower turned out to be better – making it easier to kick it off when both hands were busy with the workpiece. 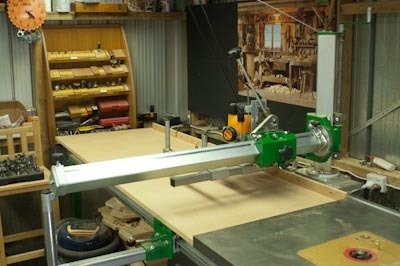 The switch, Woodpeckers Router Lift and Wixey Digital technology are all sourced from Professional Woodworkers Supplies. The Torque Workcentre dealer I’d recommend is Lazy Larry – he has and uses one, so can also answer any question you may have from an operator’s perspective. 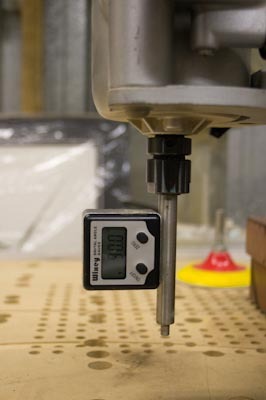 The UniLift precisely controls the height of your router bit, and by using a rule, or digital height scale you can get the height set very accurately, and also to change from one to the next. 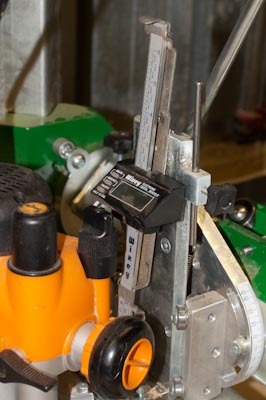 To take it to the next level, you can also fit a digital height gauge with remote readout directly to the UniLift. The Wixey Remote Readout can be used in other applications – wherever you have a linear motion (max 125mm) and want to have the position remotely displayed, to 0.5mm. The first thing I did was determine where the unit was going to fit, given the specific router I have, and that I want to be able to remove and replace the entire lift with readout attached. I fitted the bracket in a hole that is predrilled for this purpose, then bent it to the angle I required. The Triton router is quite electronically noisy, and as it has been found to cause some interference with the Wixey digital readouts, it is necessary to electrically isolate the mechanism from the router. Plastic bolts, nuts and washers are provided for this. I drilled a partial-depth hole into the underside of the router plate, and fitted the electronic rule (the green circuit board), and screwed the moving sensor to the bracket. Now all that was needed was to plug in the Cat5 cable from the remote readout, and I had precise, digitally accurate relative height measurement for the router. 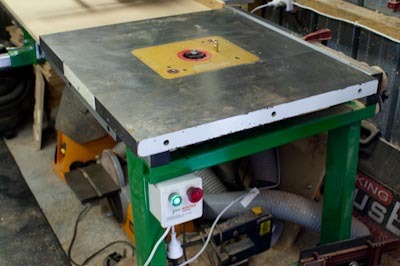 So here are the components I’ve added to continue the router table upgrade (shown in the tablesaw mount – I’ll wait for the Torque Workcentre fitting before inserting the plate into my recently machined cast iron router top). It consists of the Woodpeckers UniLift, Wixey Digital Remote Readout, and the Pro Router Switch all from Professional Woodworkers Supplies. The switch is a no-volt release 10A switch (so it doesn’t automatically turn back on after a power outage), with illuminated lights for the on and off switches. When I first came across the Woodpeckers Router Lift, I had 2 thoughts – a really visually appealing piece of engineering, and not something that would be particularly useful for owners of a Triton Router (given its built-in geared height adjustment, and particularly the microadjuster). What really bought my attention back to the router lift was a router course I went on a year and a half ago, run by Richard Vaughan. He uses Triton routers, and yet was also bestowing the virtues of the router lift, and using them with the Triton. Not being one to disregard such an expert (and informed) opinion I relooked at the whole concept, and reassessed why I had drawn my earlier conclusions. I became more aware of a few issues I had with the router, and particularly as they were beginning to age – slack in the height threads (they are nylon, not steel in the Triton router), and some tendency for them to stick slightly when microadjusting. Some of this can certainly be rectified by a good dismantling and clean, but there is something to the concept of not being dependent on the in-built threads to remain functional (not even touching on the whole Triton spares issues). The Woodpeckers UniLift from Professional Woodworkers Supplies consists of a solid anodised aluminium top, various inserts for different sized router bits, which unlike to old Triton router table, are actually flush with the rest of the surface. It comes with 3, and you can get a set of all 8 sizes if you have a need. They were originally aluminium as well, but there were too many incidents where the rings were dropped on hard surfaces which caused them to distort and become unusable. The plastic ones work as well, are as flush with the surface, and can be dropped! 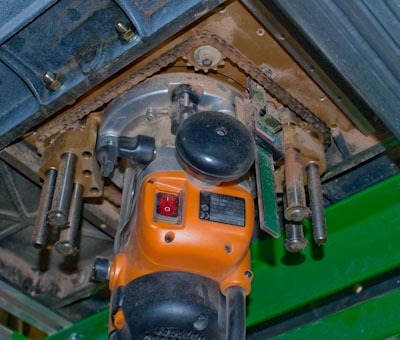 Below the top plate is where the real mechanism exists – 4 sprockets with a connecting chain, so when the height lever is used, everything turns at equal rates, smoothly raising and lowering the router. There are 4 support rods, and two threaded rods for height adjustment. 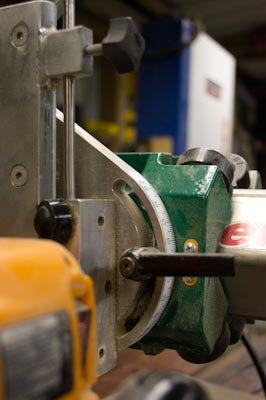 Around the edge there are grub screws to fine-tune the fit and flushness of the plate to your router table top. To fit the router, you first remove the router carrier and attach it directly to the base of the router. There are a number of holes to fit a wide variety of routers. I chose an orientation for the router to allow the best access to the controls. Next, you drop the carrier into the bottom of the base, then wind the mechanism down so the screws can be reinserted to fix everything together. That’s all that is needed to have the router lift operational. There is a brake on one sprocket which is activated with a hex key (supplied), and another sprocket which can be rotated to take up slack in the chain. 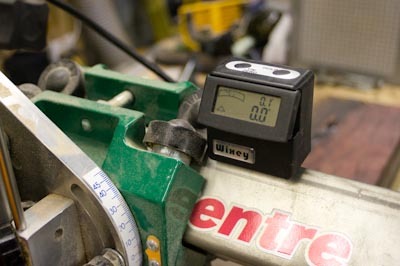 I have, as you might have gathered, I have a number of Wixey Digital products (from PWS) in my shed, from the Angle Gauge that resides in my shop apron, to the digital height gauge, calipers, planer gauge, tablesaw gauge etc etc! The problem I have been having recently, is given they are all around the same age they all seem to have a flat battery around the same time, and when you are going to use an item, that can get a bit frustrating especially if you haven’t used it much. Mentioned it to a friend, and he pointed out that I may not have been using them correctly – at the end of the day when I have fully finished using the digital readouts, instead of clicking the off button, I should in fact hold it down for around 6 seconds or so. What I wasn’t aware of (probably from not reading the manual), is if you just press the off button, that sends the screen to sleep, but doesn’t in fact turn the device off. By holding the power button down until the display shows – – – – before switching off, fully turns off the device (and thus stops the slow battery drain I was experiencing). This is not a peculiarity of Wixey products either, it will be the case for other digital readouts as well. One day, when the next generation of devices comes around with fully wireless charging, it will cease to be an issue – you’ll just leave the device sitting on the recharging mat until the next time you want it, but until then, this might be a useful trick to know.